The name Australia has a double etymology. It comes from the Latin Australis, ‘of the South’, and ‘unknown land of the South” (earth australis incognita). Australia is one of the 14 independent countries of Oceania, and is the world’s sixth largest country. It is surrounded by the Indian and Pacific ocean and the Glacial Antarctic, and is separated from Asia by the Arafura and Timor seas. It has a coastline of 25,760 km, making it a huge tourist attraction with its stunning beaches, perfect for surfing and other water sports. The Great Barrier Reef, the largest coral reef in the world, is located by the northeast coast and covers over 2000 kilometers. There are a large number of independent islands, between 100 and 300 km.Pacífico, y separada de Asia por los mares de Arafura y Timor. Tiene una línea costera de 25.760 km, lo que la hace uno de los lugares del mundo que llaman la atención de turistas por sus impactantes playas, perfectas para practicar surf y otros deportes acuáticos. 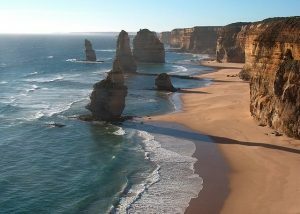 Much of Australia is desert or semi-arid. It is the driest, flattest inhabited country and has very little fertile soil. There is a mild climate in the Southeast and southwest. The northern areas of the country have a tropical climate with environments such as forests, grasslands, swamps and deserts. Australian cuisine is characterised by foods that reflect its multicultural historic past: the local Aborigine food, called bush tucker or bush-food, the British and Irish cuisine from the first European settles, and influences from Asian and Mediterranean cooking brought over by immigrants arriving after the First World War. Due to the dominance of British cuisine, there are plenty of pastries, steaks, grilled steaks, chicken and other forms of meat, generally accompanied by vegetables (known on the continent as meat and three veg). The typical Australian dish par excellence is meatloaf. There are also popular dishes, though not as popular as meatloaf, that are widely consumed. Cabanossi, a type of sausage similar to salami, for example. Other common dishes within Australian cuisine are those made using exotic animal meat like crocodile, kangaroo or buffalo. Crustaceans are also used, like mud crabs, prawns and yabbies. Located in the North, it is a vast landscape of outstanding natural beauty and cultural importance. Visiting Kakadu you will be in amongst swamp crocodiles, almost 300 varieties of bird, and have the chance to appreciate aborigine rock art. This national park is home to around 68 mammal species, 75 types of reptile, and more than 10,000 insects. For thousands of years generation of Aborigines have lived and taken care of this area of Australia: their spiritual connected to the lands is recognised in the world heritage list of Kakadu. A must-visit if you are a sea lover or like dolphins, manta-rays, tropical fish and giant turtles. The Great Coral Reef, classified as one of the 7 wonders of the world, is the largest reef in the world and offers visitors the chance to see an impressive variety of marine life. There are more than 1500 species of tropical fish and 400 types of coral, undoubtedly worth seeing while snorkeling. It extends over an area greater than the Great Wall of China and is the only living specimen that can be seen from space. You can’t visit Australia without boarding the ferry that goes through Sydney Harbor, enjoying freedom and breathtaking views. Seeing the Sydney Opera house in front of the blue sea is an iconic image that is remembered by everyone who experiences Sydney. Seeing the red desert sunrise is one of the highlights of visiting Australia, namely at Uluru. Uluru is a large sandstone rock formation in the Kata Tjutu National Park, and is the official emblem of Australian Aboriginal Heritage. Tasmania is an island full of green valleys, quiet towns and villages, and breathtaking pristine coasts. 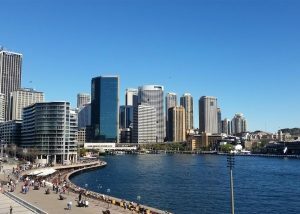 The weather is cool in winter and warm in summer, making it a good place for escaping the heat of Australian cities. In a single day you will have the chance to see beautiful lakes, valleys, rainforests and white sand beaches. A place full on contrasts that always surprises. Located along the West coast of Australia, Broome is where the desert and the sea meet. It has a multicultural population coming from Malaysia, China, Japan, Europe and the existing aborigines, which make up the heart and soul of this colourful and welcoming place. You will also find the renowned Cable Beach here; endless miles of white sands, crystalline turquoise water and camel riding at sunset. Located near the Great Barrier Reef, they are a paradise for snorkeling, scuba diving, reef fishing, water skiing, kayaking, paragliding, hiking, and much more. The magnificent Whitehaven beach is undoubtedly one of the world’s most beautiful. Staying on the mainland (Airlie Beach) is advised for nightlife and cheaper accommodation prices. This is the place for adventure lovers. This vast wilderness, located in Western Australia, can only be visited during the dry season (April – November). It is a huge area full of thickets, who measure three times the size of England. The rivers make their way though the dry desert, and you can enjoy natural pools, spectacular ravines and breathtaking waterfalls. The Barossa Region is one of the largest wine producing areas in Australia, producing more than a quarter of its wine, including well-known brands such as Jacob’s Creek, Penfolds and Wolf Blass. Located 45 km northeast of the city of Adelaide, the wine region of Barrosa is part of Southern Australian culture. Interestingly, it has a certain German flavour due to the influence of German settlers.